An ensemble comedy, a paranormal investigation, a hoarder intervention and a house-flipping misadventure, THE HOARD is the ultimate reality TV parody, but it is also, at its heart, a poignant documentary about the true intersection of lifelong collector and Grey County gardener Barry More with a run and gun gang of indie filmmakers. 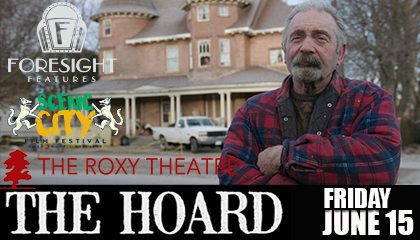 Filmed in Owen Sound, Ontario, and written by Pontypool author Tony Burgess, THE HOARD is an investigative horror/comedy feature where fiction and nonfiction collide. It’s a modern mashup of the absurd reality TV realm we all love to hate: extreme home renovation, ghost-hunting, intervention, and of course, hoarding. The film depicts the ill-fated effort of a group of Reality TV stars trying to produce a pilot episode for their comeback series “Extremely Haunted Hoarders”. This disastrous adventure spirals into a supernatural nightmare. The John Fogerty CCR Story!